I veered off my usual fiction path and recently mistakenly meandered into the realm of non-fiction essays. 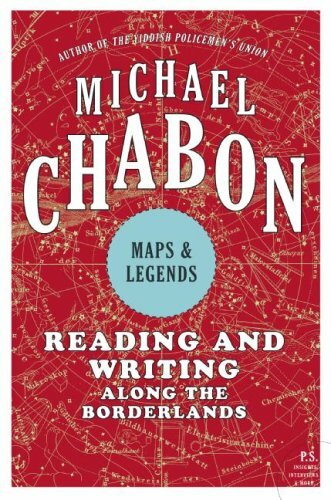 Maps and Legends Reading and Writing along the Borderlands by Michael Chabon is a collection of essays touching on his life, and focusing on what he calls “the borderlands” -- the places where genres are undefined (is it fiction or science fiction? Why does it have to be one or the other? ), and how he as an author has grown and changed through his works. I read it cover-to-cover, but you really don’t have to (I guess that’s the benefit of “collections” over novels?). The opening essay, titled “Trickster in a Suit of Lights: Thoughts on the Modern Short Story,” is great and was probably my favorite part. "I read for entertainment, and I write to entertain," Chabon writes, shortly after implying that no serious writer should ever admit such a thing: "Entertainment has a bad name. Serious people learn to mistrust and even to revile it. The word wears spandex, pasties, a leisure suit studded with blinking lights." But Chabon reminds us that literature, at its versatile, entertaining best, is "a two-way exchange of attention, experience, and the universal hunger for connection" (source). Other chapters that focus on specific works include: "The Killer Hook: Howard Chaykin's American Flagg!," "Dark Adventure: On Cormac McCarthy's The Road," and "The Other James.” The essays stand on their own – you don’t have to have read the original works (I haven’t read any of them), but I suspect those essays are much more enjoyable if you know the references. From the chapter "Fan Fictions and Sherlock Homes:"
There are also a few chapters on comics, a major Michael Chabon theme (as I remember from The Amazing Adventures of Kalvalier and Clay), which are interesting, but not particularly my jam. The bottom line is, if you know and love Michael Chabon, you’ll probably really enjoy this book. But if you haven’t yet read his works, I recommend starting with The Amazing Adventures of Kalvalier and Clay and/or Wonder Boys.